UPDATE (March 8th, 2012): Intuit has built a Lion-compatible version of Quicken 2007! You can read all about it on their site, at this page. Unfortunately, they do not provide a link or any information about how you go about getting the Lion-compatible version. Come on, Intuit. That’s not very nice. I managed to find the link for you: click here. They want $14.99 for the download but if you want to run Quicken on a Mac with OS X Lion (or a later system) you have no choice. Spend the $14.99. By the way, you will not find any new features in this version, unless you call “functional” a new feature. Mac OS X 10.7, otherwise known as “Lion”, is coming soon. If you are on 10.6.8 you’ll be able to download it in a few weeks for $29. It might be better if you don’t, because you might not be able to use some of the software you’re used to using. Such as Quicken. Yes, Quicken. After all these years (five of them), Quicken is still not Intel-native. Instead, it’s written for the older PowerPC chip (PPC). Apple provides software called Rosetta which translates PPC programs into something the Intel Macs can use, but it slows everything down and while it’s available in every version of Mac OS X from 10.0 to 10.6, Apple is leaving it out of Lion. What it means is you will not be able to use Quicken on a Mac running Lion. You can read all about it here, straight from Quicken’s support web site. It’s easy to get mad at Intuit (Quicken’s publisher) and say they should have built an Intel-native Quicken by now (five years after Apple announced the switch to Intel chips). In fact, it’s so easy that a lot of people have gotten mad and said that already. I wouldn’t bother. Intuit has a very poor track record when it comes to listening to customer feedback regarding their Macintosh products and I would not expect them to change their tune now. If you’re already using “Quicken Essentials” you’ll be OK– Quicken Essentials is Intel-native. But, most people use the “real” Quicken, because Quicken does more than Quicken Essentials does. Essentials can’t pay bills online, and it can’t track investment activity (though it does show you how much each investment is worth). The reports aren’t as good in Essentials either. QuickBooks is a different story. QuickBooks might work with Lion (at least it’s Intel-native, so there’s hope). With Quicken, there’s no hope. Actually, there is a tiny bit of hope: Intuit might try buying or licensing Rosetta and folding it into Quicken itself. I don’t think they’ll be able to do that, but if they do it would be a slick solution. Better, of course, would be for Intuit to hire more Mac programmers and have them build an Intel-native version of Quicken. Even better would have been to start this effort a few years ago. There are plenty of other programs that won’t work in Lion too. Anything that it written for the PowerPC chip simply won’t work. Easy way to find out whether your programs are PPC or not: open the Applications folder, click once on an application, then Command-I to Get Info. Look toward the top of the Get Info window. You want it to say “Kind: Application (Intel).” See below. Note: just because it’s an Intel application doesn’t mean it will work just fine in Lion. There could be some issues, but at least we have a chance. If you see something like the following, you’re sunk. 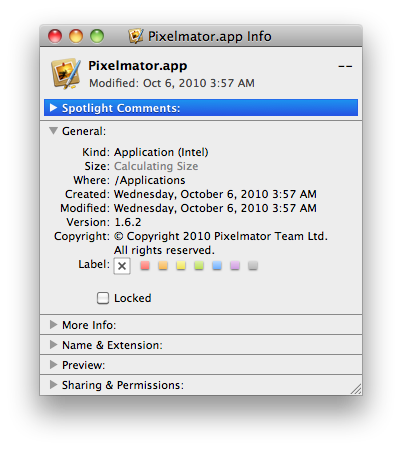 This application will not ever work on Lion. You can do this on a one-by-one basis, which is fine, or you can do it all at once. To do it all at once, go to the Apple menu and choose “About This Mac…” and then click the “More Info…” button. That will bring up the System Profiler, and in there you can click on Applications and see what kind of app each item is. See below. Just remember: PowerPC apps will not work on Lion. Intel apps might, and it’s likely that most of them will (maybe after an update or two). Classic apps won’t work on Lion either, in case you were wondering. This looks to be a somewhat messy transitional time in the Mac world. Some software is going to be left behind. Some people are going to stick with 10.6 as long as they can in order to keep using their older software. If you’re thinking of buying a Mac in the next few months and you have some PPC applications it might make sense to buy a Mac before Lion comes out, so it will have 10.6 installed and therefore, Rosetta. Eventually you won’t have a choice, but right now you do. Do some legwork now and figure out whether you’re going to have issues with Lion so when the time comes you’ll be ready. wow, thanks for the heads-up. You're welcome. You'd think Intuit might be able to send an email blast to all of its registered users, letting everyone know that there might be a problem… would be so easy. Give me some more details. 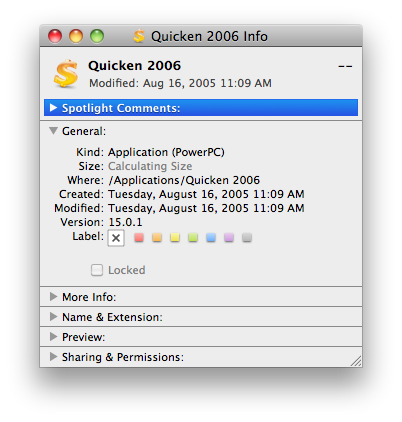 Which version of Quicken? When did things last work– on 10.6.7? What happens when you try to do Find and Replace? I happen to be running Quickbooks Pro 2007 on my iMac, but on Parallels 6. So it's actually a Windows version. As long as I'm running it through Parallels I should be ok correct to go ahead and switch to the Lion OS? I brought that table up of my applications like you suggested and I dont have anything running PPC, but I do have some lines coming up saying Universal. What is that? thx for the great article and the help! "Universal" means that the application can run natively on Intel chips as well as on PPC chips. That doesn't guarantee compatibility but it's better than seeing "PPC" only. 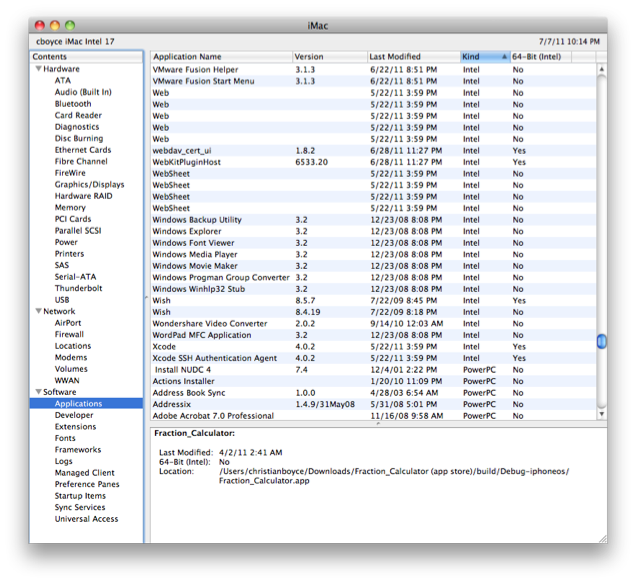 If it's something you need, better check with the people who make the apps to see if their apps will run on Lion.